The obvious joke to make upon hearing the news that the internet-famous cat Grumpy Cat will be making a cameo in the Broadway production of Cats on Friday, September 30 is that millennials and their memes have gone too far. And, look, we kind of get that. The press release for this absurd publicity stunt features a quote from “Grumpy Cat” herself in which she explains, “Being selected as the first real cat to perform in Cats on Broadway is an honor. I hate it. If I’m really being honest, I’d prefer to play the Phantom in The Phantom of the Opera.” And, yes, that’s kind of terrible. But, on the other hand, have you seen Cats? It not only requires grown adults to dress up in oddly sexual cat costumes, it also has them enact a staggeringly bizarre plot. A tribe of “Jellicle cats” gathers in a junkyard for a “Jellicle ball” before deciding which one of them will be sent to be reborn on “the Heaviside Layer” a.k.a cat heaven. Then the show spends the majority of its runtime simply introducing new cats who have names like Munkustrap, Old Deuteronomy, Skimbleshanks, and Mr. Mistoffelees. And this isn’t some abstract piece of performance art beloved only by weird theater kids, it’s the fourth-longest running show on Broadway. It’s also the sort of thing that should really make Gen X-ers reconsider their scorn of insipid millennial passions—glass houses and all that. 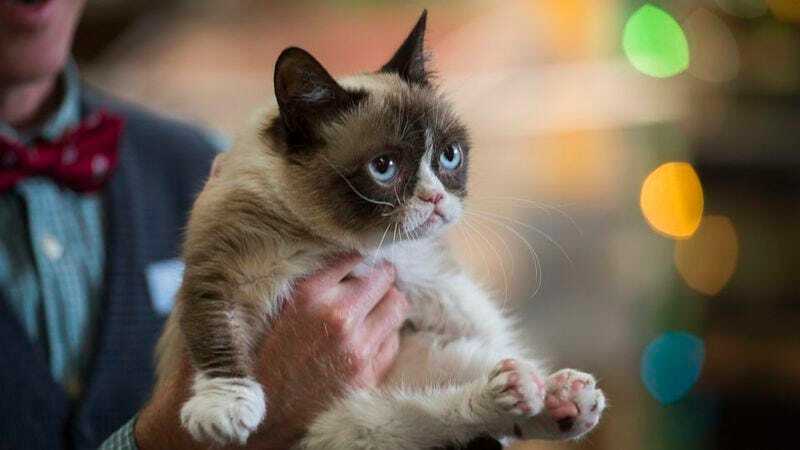 Anyway, according to a Cats spokesperson, Grumpy Cat will be “worked into the end of the show and will become an honorary Jellicle Cat.” Which means that shortly after the tragic outcast cat Grizabella (currently played by British pop star Leona Lewis) sings “Memory” and is sent to her symbolic death on a giant flying tire, Grumpy Cat will lighten things up a bit with her classic grouchy demeanor. It sounds like a match made in Jellicle heaven.